Comments:Just looking for ideas on a new website. You site looks great! Comments: I am National Council CIO. Great job in delivering value to your members and families. This is a good model for nation-wide initiatives. Comments: Great website. We are working on our website and are browsing others to see what we need to put on ours. Yours is easy to navigate. Comments: Nice web page hope to see you guys at sneak in weekend. you guys as the troop im going to study on. Comments: Really creative and useful website. Keep up the good work. Comments: Great work. I love it!!!! ideas to forward to our webmaster. Comments: Great web site. Looking forward to making our own. Comments: Great job with the website! Comments: What an awesome site!! I am trying to start a site for us as we are a new pack. URL: Comments: A very nice site! Comments: Great web site. We are still going strong 100 years on. Comments: Tom - Thanks for the great website, we at pack 467 are in you debt. Comments: Nice site ...very informative! I wish all volunteer scouters in Rowan could see this site. Comments: GREAT WEB-SITE. I REALLY ENJOY LOOKING AT PICS WHERE THE BOYS ARE HAVING A GREAT TIME WITH EACH OTHER. Comments: great website. The kids are really having fun. great work. You make us proud!! Comments: Great site! Love the look and easy navigation. Looks like your all headed in the right direction. good work. I love you daddy. 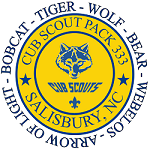 Comments: I am the pack committee chairman of pack 372 and I must say you have a beautiful website. Comments: Thanks I was looking for a format for the Website Im going to do for my pack. Comments: Great! I got a few ideas for our pack web site from here. at yours. Keep it up - its a lot of work!! Comments: Keep it up uncle Tommy, you're the best. Comments: Thanks for the great website. Comments: Thomas is a great cub scout leader. Keep up the good work. Comments: Great Site !!! Keep up the good work. Comments: great sight, love looking at childrens pictures. they r having so much fun & learning so much.